Five-time world champion and Olympic bronze-medallist M C Mary Kom has become the first Indian to be picked as the International Boxing Association's (AIBA) representative for the IOC Athletes' Forum scheduled in November. The 33-year-old, who is also an active parliamentarian, has been invited to attend the 8th International Olympic Committee's (IOC) Athletes' Forum in Lausanne from November 11 to 13, 2017. "This bi-annual forum brings together athlete representatives from across the Olympic Movement and provides an in-person community where athletes can exchange and discuss their viewpoint," the AIBA wrote in its invitation letter to the Boxing Federation of India (BFI) President Ajay Singh. 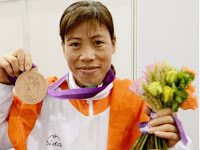 "In this respect, we would like to designate Ms Mary Kom to attend the forum as AIBA representative," the letter stated. The event, however, overlaps with the Asian Championship in Vietnam, which is scheduled from November 2 to 12. If Mary Kom is selected for the tournament after trials later this month, her participation at the IOC event would become uncertain. Among the most decorated athletes in Indian sports, Mary Kom is an Asian Games gold-medallist besides being a multiple-time Asian champion. She was conferred the AIBA Legends award at annual gala of the world body last year.